This new and revolutionary modern dental implants system, often known as Same Day Teeth or Same Day Smiles, enables us to provide a new smile in just one day! Are Same Day Teeth Suitable For Me? Have uncomfortable and loose dentures that are affecting your quality of life. Suffered from severe tooth loss. 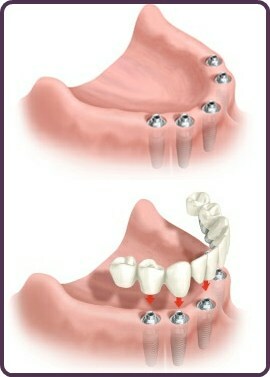 Have teeth with poor prognosis (needs extracting) or crowns & bridges that are failing. At the start of the process we will take X-rays of your mouth and teeth and will also take impressions so we are able to create a replica of the patients jaw. This will then be used to help us custom make a fully loaded (with teeth) removable denture. Depending on your case, a CT scan may be required before we are able to place the dental implants successfully. When it comes to the day of having the dental implants placed we will use a numbing local anaesthetic agent for the mouth and if the patient has requested Sedation, this will be administered before the work begins. For standard dental implant procedures, the implants would be placed and covered up, a temporary prosthesis (restoration) would be put back in the patients mouth, followed by a healing period (can be around 3 months) before the final restoration is attached to the dental implants. This is where the Same Day Smiles procedure differs – the final restoration will be securely attached at the day of the implant placement, allowing you to leave with your new smile in just one day! This is a vital stage of the Same Day Smiles process. At this stage you will need to attend an assessment and checkup so we can ensure that the implants are settling in well and if there will be any minor alterations that need to be made. It might be that an alteration is needed, because the mouth will be healing after the implants are placed and changes will occur in your mouth. The implant dentist will advise you of when this aftercare appointment will be needed. We offer free same day teeth implant consultations, so we can examine your case in detail, assessing to see if you are suitable for the same day smiles treatment. 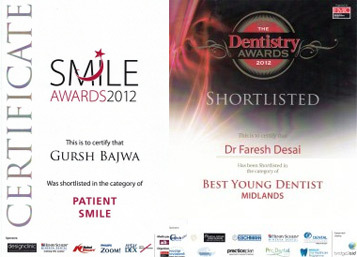 If you would like to find out your options, please do not hesitate to call us today.